WAIST HIGH: Roland Orzabal. Waist High Love You Long Time. Since You Were 22. Roland Orzabal. Waist High Love You Long Time. Since You Were 22. 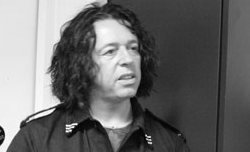 Happy 43rd to my old friend Roland Orzabal. Ever since I made my grandparents take me to buy The Hurting in 1983 in the Dodge Dart, I have been a fan.